Solution Tree is a leader in the K12 professional development space. Their authors and experts are in high demand for onsite PD. But not all districts and schools have the time or budget for their entire staff to attend an event or to bring a consultant onsite. Even when they do, it’s difficult for schools to maintain the concepts learned during events or onsite PD days. Solution Tree was interested in making their content - video, books and educational tools - accessible to these schools in a subscription service. During the first stage of this project, we interviewed Solution Tree’s staff, authors and educational experts to better understand the context of the end user, their problems and the content that was to be used in the project. We designed and administered a survey to thousands of Solution Tree’s customers to confirm what we had heard in these interviews. We then built a network of “Design Partners” from Solution Tree’s customer-base and held regular focus groups to discuss potential features, wireframes and prototypes as the project design evolved. Simultaneously, we performed competitive analysis to ensure that pricing, messaging and feature-set would be competitive We worked with Solution Tree’s Accounting and Management team to build projections and a P&L that would ensure the desired profitability. Based on this work, we recommended a technical stack and framework (LAMP/Zend), CSS Library, hosting environment (AWS), and development team. Using SCRUM agile development, we established a dedicated team of development and QA engineers in our offices in Noida, India. We then worked in two week sprints - interacting with Solution Tree staff throughout - to deliver a minimum viable product in time for Solution Tree’s event season. We worked directly with Solution Tree’s Marketing and Sales teams to relay the product research and develop marketing materials (website, sell sheets, promotional videos, and sales training curriculum). 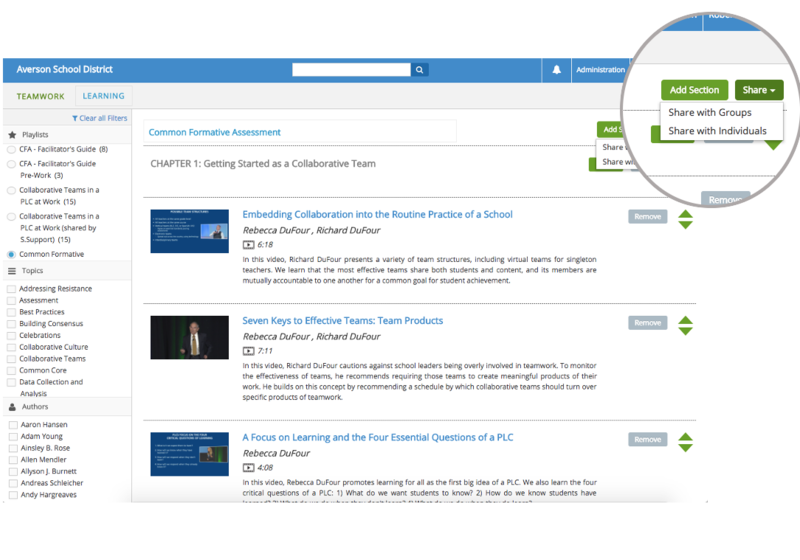 ​We have since worked with Solution Tree to extend and maintain the Global PD Library with direct feedback from Solution Tree staff and customers. As we worked with Solution Tree’s customers, we realized that the vast amount of content in the library could be overwhelming to some. Many PD coordinators needed a way to focus their staff on very specific content. To enable this, we built functionality that allowed educators to build and share their own playlists with individuals or customized groups. Solution Tree staff also curated a series of these playlists based on their best selling books and PD topics.